Submitted by via CornwallLive on Mon, 06/03/2017 - 16:51. A modern "transport hub" is officially coming to Cornwall after European funding of up to £5.4 million was secured by a project which is part of the Cornwall and Isles of Scilly Growth Programme. 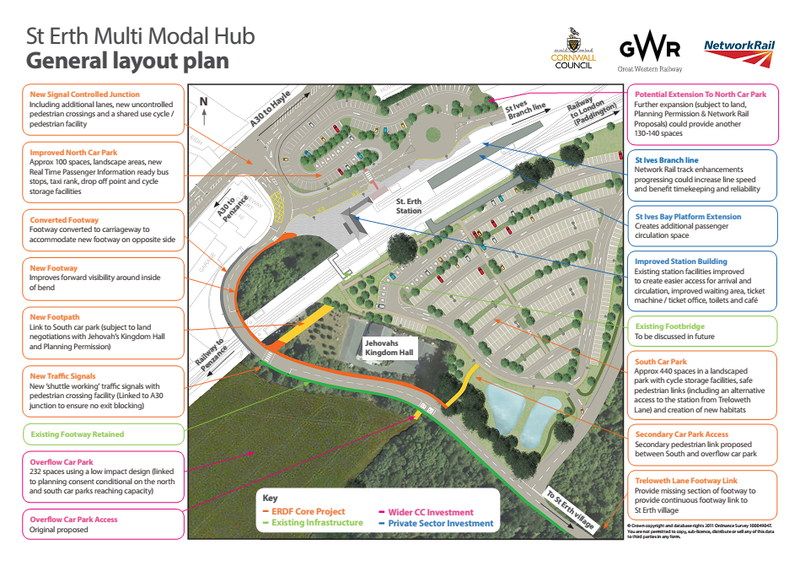 The Multi Modal Hub project will connect Cornwall's main rail line, A30 trunk road, St Ives rail park and ride service and the strategic Cornwall bus network and support adjacent employment space. Campaigners have called for changes to the "dangerous" road layout for a while. Last year, the widow of the biker Mitchell Gilbert, who was killed in an accident nearby, said she was "mortified" that a change had not yet been made. A new signal controlled junction is one of the improvements highlighted by the project. The project is expected to complete in summer 2018. 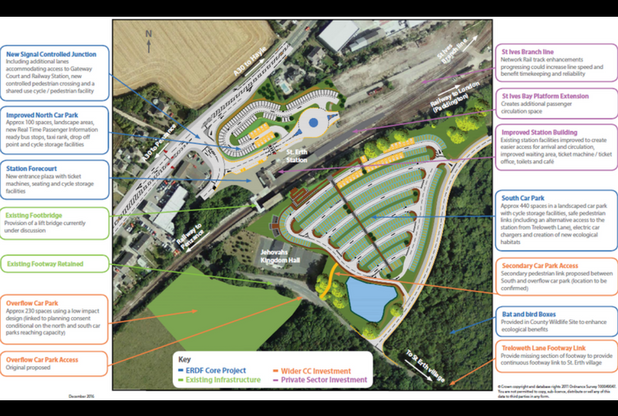 The area around St Erth railway station will now be developed after the European Regional Development Funding (ERDF) was matched by £4.69m of investment from Cornwall Council and the growth deal. It is hoped the project will enhance the capacity, attractiveness and commercial viability of public transport in the area by attracting new business and inward investment. St Erth Multi Modal Hub general layout plan. It also hopes to secure further improvements at St Erth Station from private transport operators and reduce the high dependence on private car transport which it says is prevalent in west Cornwall. 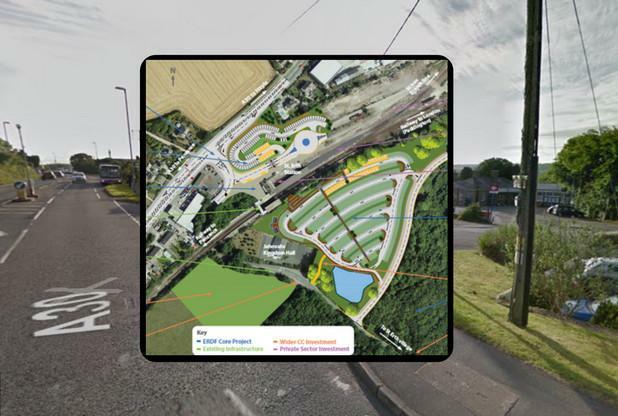 "I'm really pleased we have secured this important investment that will support our residents to commute into and out of west Cornwall to access jobs and to be able to enjoy the fantastic environment," said Julian German, Cornwall Council's portfolio holder for economy. "It also has the added bonus of enhancing the transport offer to the tourists we welcome each year which should reduce congestion on the roads." It is said users of the new facilities can expect improved cycle and pedestrian facilities, new pedestrian crossings, cycle storage and an increase in the number of available car parking spaces. It is aimed at coordinating and bringing together all the transport on offer to help residents get around easier as well as improving transport for the tourists. Cornwall Council Cabinet member for transport Bert Biscoe said: "This significant investment is not only welcome, but indicative of the way in which EU investment continues to help Cornwall set up the structures it needs to foster a positive and enduring economy. "It will provide a modern public transport focus that will be a key part of the new single public transport system for Cornwall, and will alleviate traffic pressures on St Ives and the surrounding villages. "It will be important to ensure that the infrastructure and landscaping fit in with their surroundings, supporting St Erth and merging easily into this important rural setting, taking as little good quality farmland as possible."